This map was originally drawn as a supplement for my Out of The Abyss DM guide. It’s Sorcere, the drow mage’s Tower in Menzoberranzan. It’s one of the most important places in the city. This is where young apprentices come to learn and master the art of magic, under the tutelage of senior mages. Above everybody else is the Archmage; the highest most sought position in the city’s power scheme. It can be easily repurposed for different adventures or settings. In an of itself, this is a place of magic and spellcasting. It can be a magic school, a magician’s guild, a rich wizard’s residency. 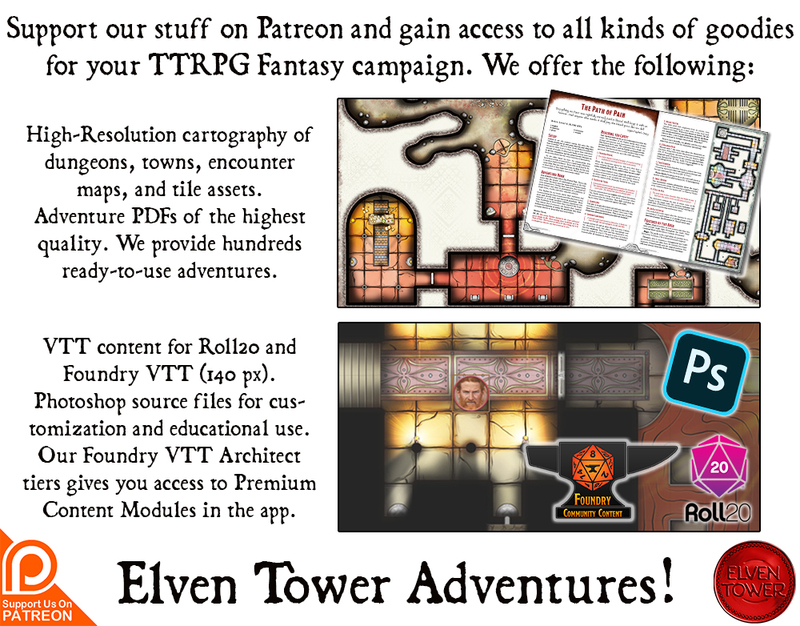 The party might be tasked with infiltrating the tower to destroy the arcane focus gem in the third floor. Or it could be the opposite, the party is tasked with protecting the tower against invaders who wish to destroy the same arcane focus. 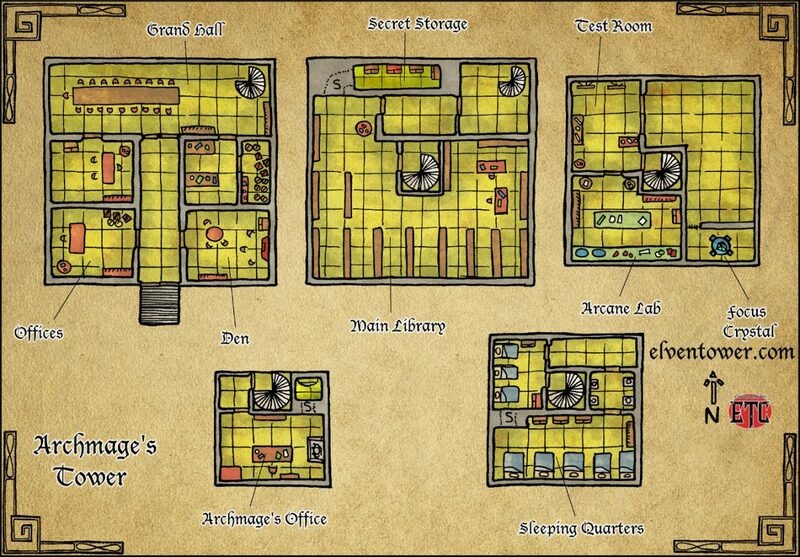 In the first level of the tower, There are offices, a den, the grand hall and some storage rooms. This is where people from outside the mage’s community come to dine and converse with the mages. Often grand balls are held in the big room (grand hall). Semi important visitors are welcomed to the den for a meeting with a mage. The second level of the tower holds the main library. This place is accessible to outsiders with special written permission from the Archmage. This level hides a secret storage room where the most valued tomes and scrolls are held. The third level of the tower gives access to the test room, where young apprentices can practice their magic arts. It’s got a complete supply of magical components for a wide variety of spells. There’s also an Arcane Lab, where senior mage’s experiment with alchemy and magical brews. Sometimes magic items are crafted here. There is another room in the third level. This room shelters a giant blue gem which serves as a focus for a magical shield protecting the tower and maybe even the city. A good suggestion is to have an anti-teleportation field. That prevents any kind of teleportation magic within its area. Fourth level of the tower contains the sleeping quarters of apprentices and senior magic users. Level five of the tower only gives access to the Archmage’s office. The place is magically protected from scrying and the statue is a Stone Golem which defends this room. There is a hidden door next to the statue. This door is hidden and trapped, depending on the party level, different traps might be used, but it’s supposed to be a lethal or incapacitating trap. Sleeping gas trap, Fireball trap or Imprisonment trap are all good ideas. it leads to a small secret room that only contains a big ornamented mirror. The mirror is a gateway to the real inner office of the Archmage, which lies in a pocket dimension.